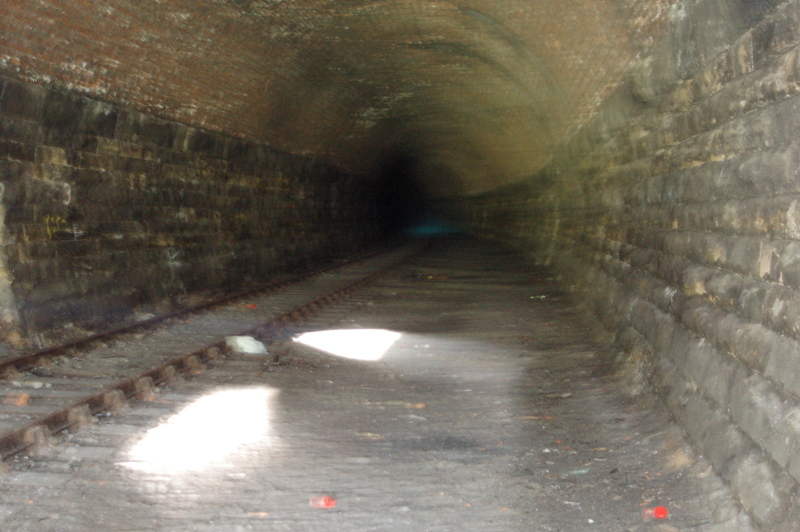 A few days ago I was invited to walk down a disused railway tunnel in Preston called Miley Tunnel. 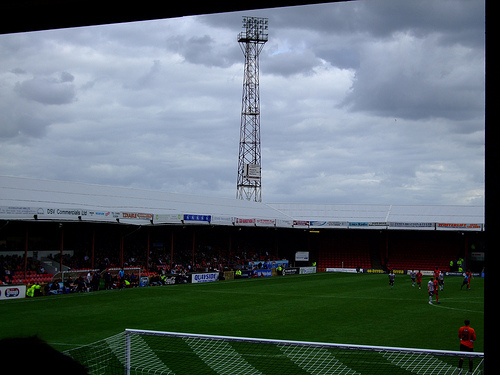 It’s only a quarter of a mile long, however it was apparently haunted by a grey lady who would walk the tunnel towards any oncoming visitors. Myself, Joe Stashko and Andy Halls decided to check this out for Blog Preston to see if there was any truth in this legend. So armed with torches and a camera we headed down to investigate. Now before I go any further let me just explain a bit about the tunnel and the railway that used to run through it. The Preston and Longridge Railway company opened a line from the Lancashire city which ran 6.5 miles to Longridge in 1840. Originally the wagons on the line were horse drawn or powered by gravity (which sounds a bit risky!). In 1846 the line was taken over by the Fleetwood, Preston and West Riding Junction Railway who had an ambitious plan to use the route as part of line which would connect Fleetwood to Leeds and Bradford. 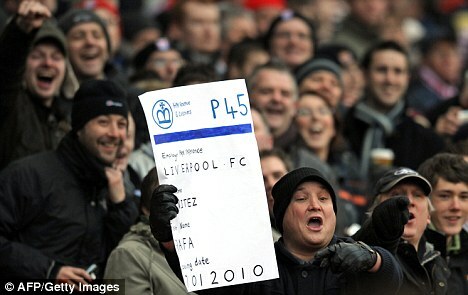 However this never materialised and no extensions were built. By 1930 buses in Preston were proving to be the more popular way of moving about so the line closed to passengers. Freight traffic remained until 1980 when the line closed for good. So what of the line today? Well it’s very overgrown for a start. 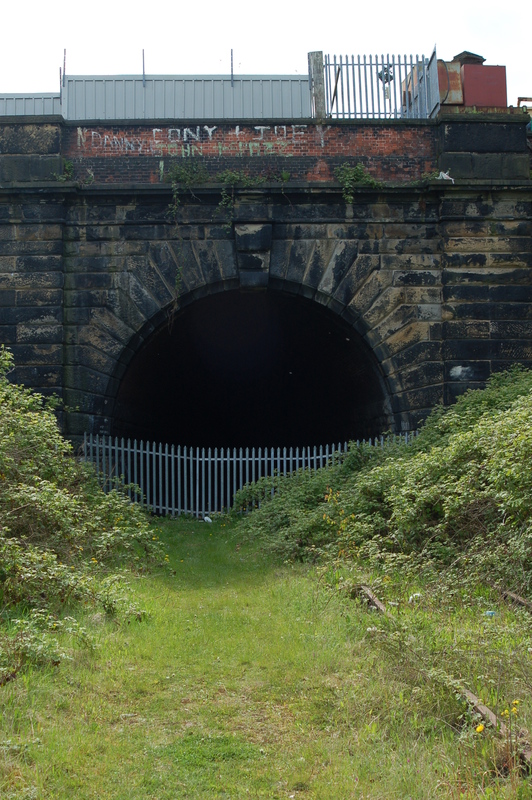 We decided to walk from the Deepdale end towards the West Coast Main Line, with the other end of Miley Tunnel being located in the heart of the University of Central Lancashire’s campus. Scrambling down the banks of the cutting proved to be a challenge with brambles aplenty. If you don’t fall over the twisted branches then the rusty track and rotten sleepers are hiding in the weeds waiting to trip you up. The tunnel itself was dirty and full of litter with a bent fence at the end offering a feeble barrier between us and the dark. After 200 yards or so the tunnel curved round and very quickly the last remaining traces of sunlight disappeared leaving us in total darkness and liable to fall over the track and dips in the ballast. 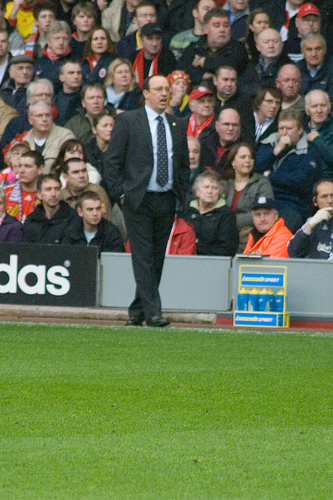 If the ghost was to appear then this was the time. Well after a few more paces a white light started to appear in the distance, rapidly getting bigger and bigger. And you know what it was? The light coming in from the other end. No grey lady or any other ghost. A couple of minutes later we had reached the other end with no haunting experiences. The only thing which puzzled me in the trip is in the two photos below. 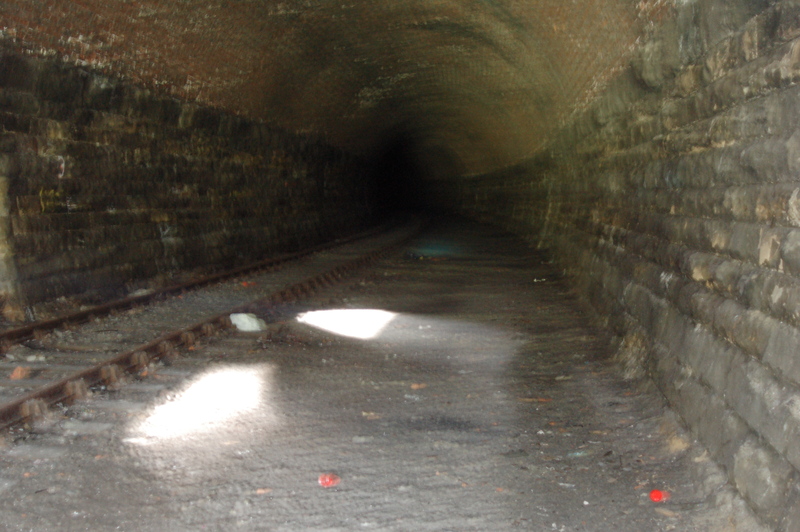 These two photos were taken at the Moor Lane end of the tunnel, where the line is in a deep cutting briefly between the Miley Tunnel the other shorter tunnel under the university campus. I apologise for the blurriness of these photos however they were on a 1.6s shutter release and I didn’t have a tripod so the quality of them is reduced. But what is that blue line? It may just be a trick of the light or my flash but it doesn’t make much sense in my mind. If anyone has any ideas or just some wild speculation let me know on the comments below! Maybe I’m being an idiot. Maybe I’m looking for something that isn’t really there. It’s probably nothing but part of me wants it to be something. For more photos of Miley Tunnel, please visit my Flickr. 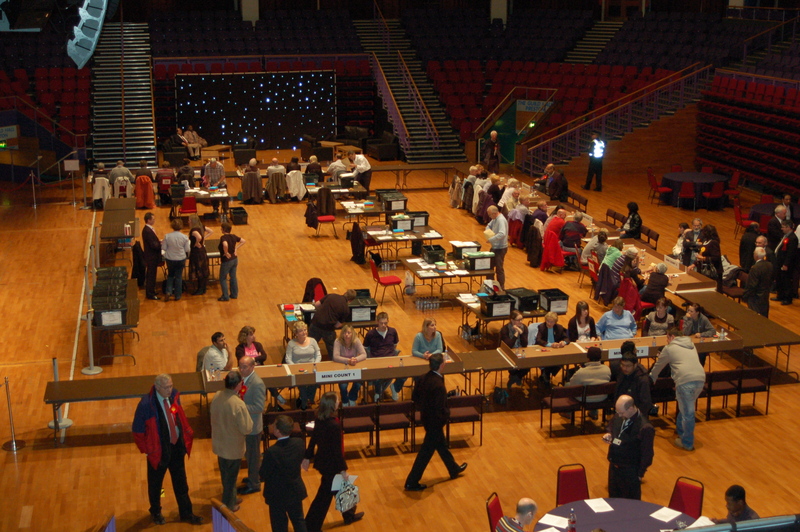 Last week saw myself and three other journalists cover the General Election in Preston for Blog Preston. My main role of the evening was to get photographs for the website, both of the count and of the key people at Preston Guild Hall without breaking any laws! So here this time are some of my photos of the evening, in chronological order, with some information about each one to give you an idea of how the night unfolded. It was a very long evening. We arrived at Guild Hall at about 8.30pm, and left just before 5am on the Friday morning. Apparently another count in Lancashire saw the journalists given bacon sandwiches, how I could have done with one. Sadly none were forthcoming which was a disappointment! 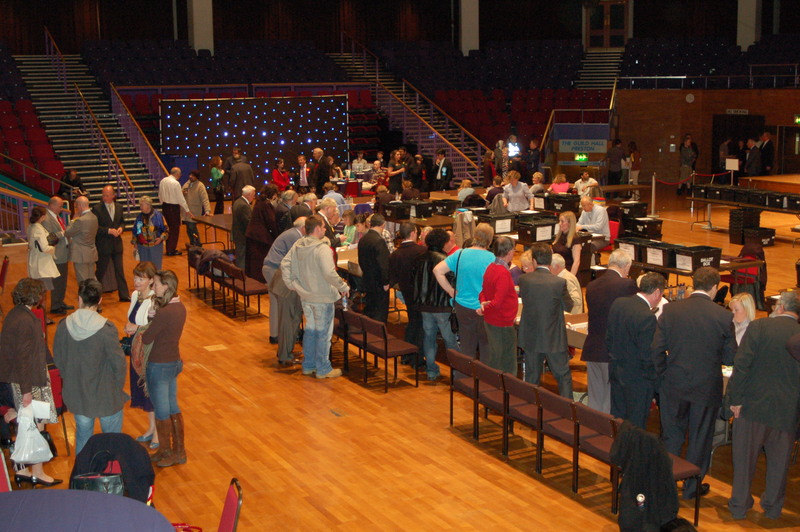 Taken early on in the night, this was the scene in Guild Hall at about 9.30pm before any ballot boxes had arrived. Nothing much was really going on with just a handful of city councillors and journalists wandering about and preparing for the night ahead. Our home for the evening. 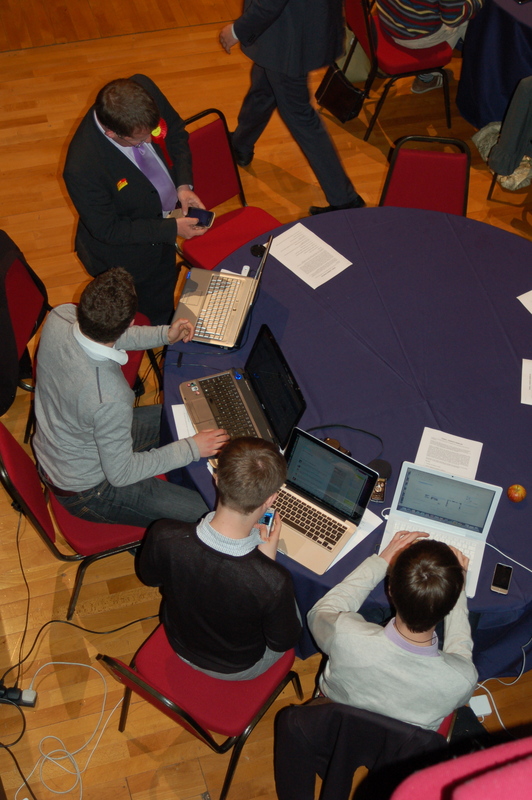 The four laptops set up in the corner of Guild Hall. From left to right; Andy Halls, Daniel Bentley and Joe Stashko all ready and raring to go and report the evening’s events. This turned into a familiar sight as the night went on. 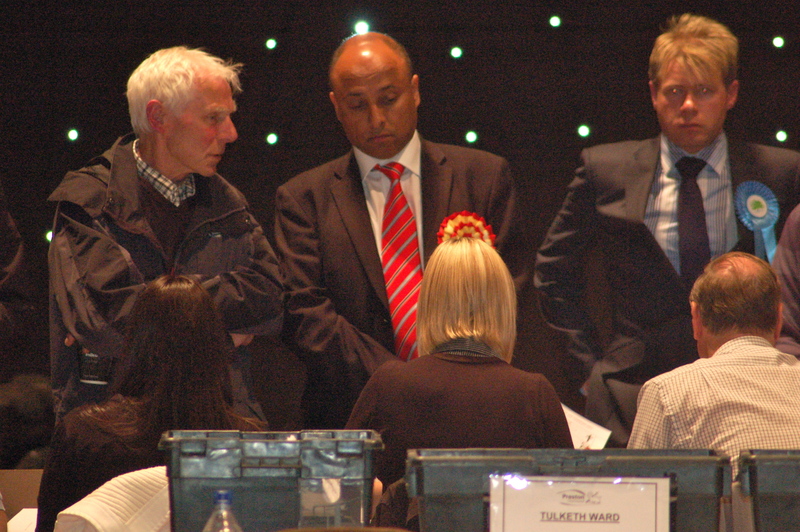 Labour candidate and current MP Mark Hendrick observing the count and sorting of ballot papers. For hours he went round just watching the papers being counted with a nervous expression on his face and refusing to do any press interiews. None of this helped to dampen various rumour that were flying around the room about which way the vote was going. Another common sight, lines of councillors standing over. 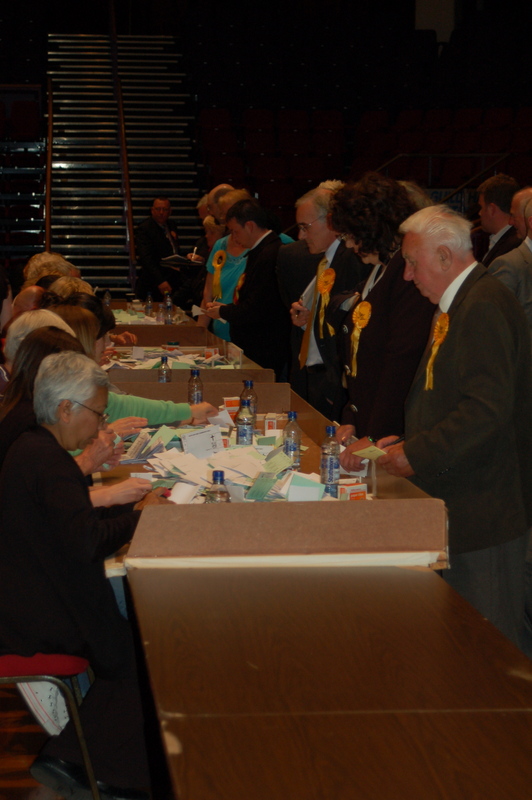 The Lib Dems were taking a much larger interest than others, as you can see by the line of yellow rosettes! Quite what this achieves I’m not really sure, especially when they are only sorting between the General Election and local election papers, which was the case here. Later on me and another journalist had a look round during the count to try and get the winner and we weren’t all that accurate! A lot busier than earlier! By now everyone decided to get in on the act and have a good stare at somebody putting ballot papers into different piles. Completely pointless but with a fair bit at stake it’s understandable I suppose that people were going to just watch this all night long. Joe Stashko and Daniel Bentley interviewing the Conservative candidate, Nerissa Warner-O’Neill for Blog Preston. I attempted a shot of shotting over Joe’s shoulder and into the screen on his video camera to give the view he had of the interview as well as my own. It worked to an extent though there was an issue with the focus of the image, however you can see the image on the screen in this shot too. A conversation which was of great interest to us between Nerissa and Mark Hendrick. This went on for about 10 minutes and I’ve never before heard two people talk so quietly! What they were talking about, we can’t be sure, but I thought it would be interesting to get a photo of the two chatting. From where they were standing, this was the only place I could get a photo from in front without standing right in their faces and making them quite angry! The facts. 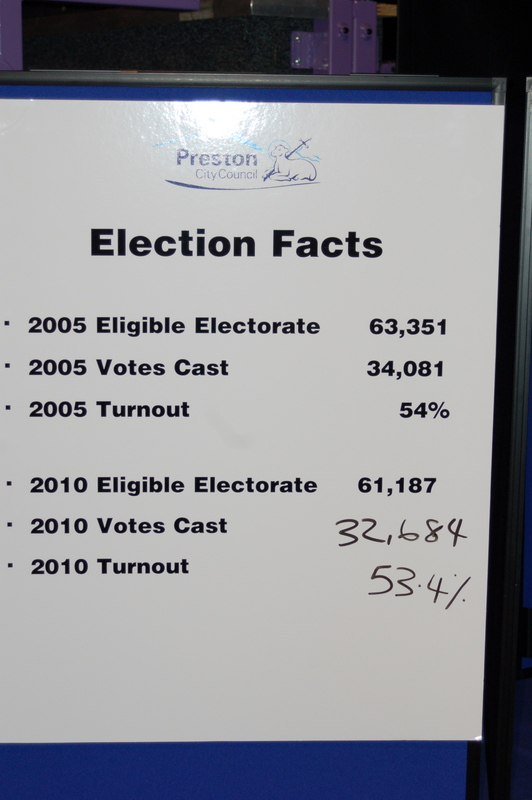 Unlike most parts of the country, where the turnout was higher than in the previous General Election, Preston saw a slight dip in voter turnout this year. You may notice that the number of people eligible to vote was also down. 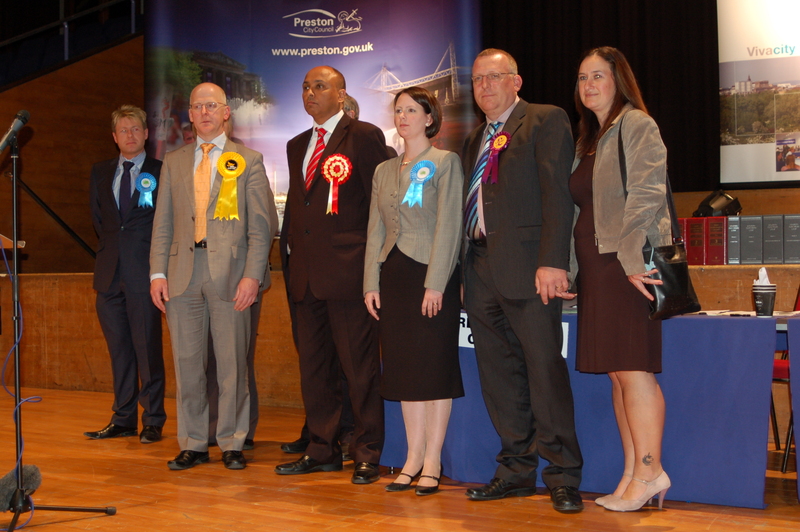 A reshuffle of various wards in the past few years has seen the Preston constituency shrink since 2005. 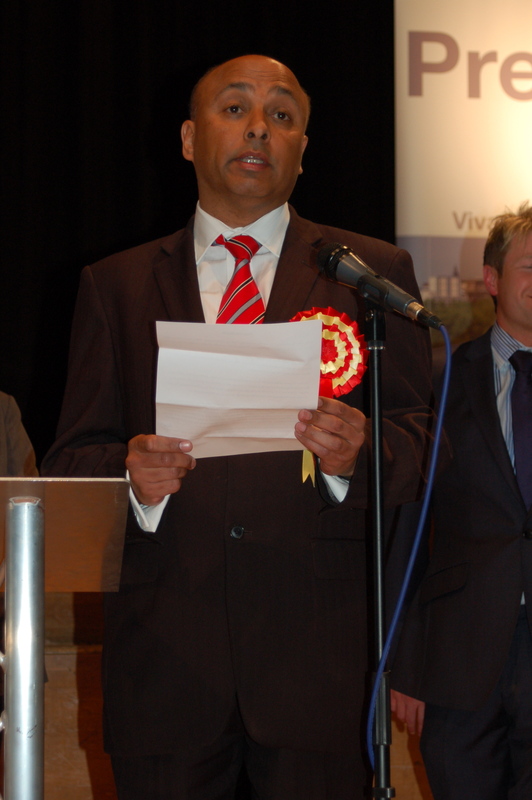 For example, Bamber Bridge is now in the Ribble Valley constituency…no I don’t get that one either. 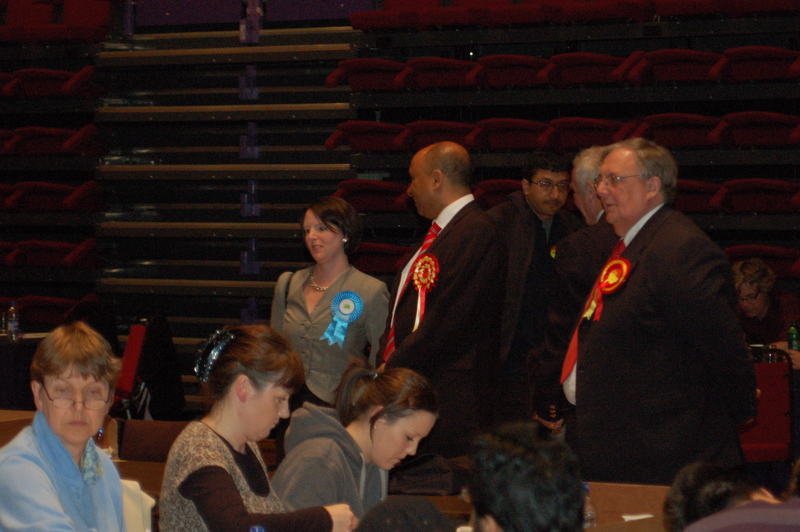 The candidates on stage awaiting the results to be announced. If some of them don’t look too cheerful that’s because they’d already been told the provisional results, and they didn’t all win! The candidates on stage were (from left to right): Mark Jewell (Lib Dem), Mark Hendrick (Labour), Nerissa Warner-O’Neill (Conservative) and Richard Muirhead (UKIP). The victory photo. As the Lanchashire Evening Post’s photographer organised the Labour group to celebrate their victory, he positioned himself in front of a sofa. 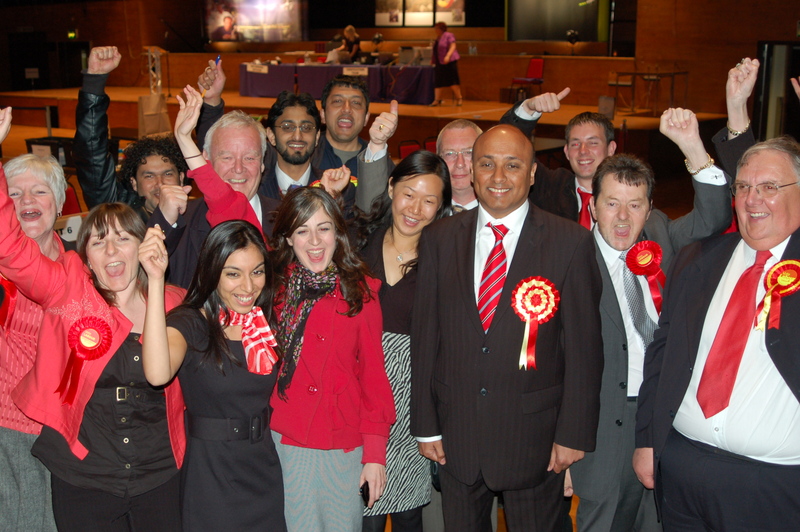 So I climbed onto the sofa behind and took this photo of a very happy set of people with red rosettes. The smiling faces could either be about the fact they won the seat or that finally they could go home, as it was gone 4am by this point! That was what pleased me the most as it was a very long night. Worth it, but long!